In the Seattle Wastelands, gang members are being captured and enslaved by a team of super-powered warriors. . .survivors of Borsten's "collection" of time-displaced gladiators, including Stanley Harris (Hex's Vietnam War-era companion), who have been given their powers by and are working for a mysterious being called S'ven Terah. In New York City, Hex resumes his search for Stiletta by going after The Combine with guns blazing. This series sad attempt to revitalize itself by including superheroes continues in this issue and relegates Hex to almost becoming a secondary character in his own series. The worst part about it is that "The Dogs Of War" are probably one of the worst superhero teams I've ever seen, with clumsy dialogue that you can easily tell Fleisher was uncomfortable writing and cliché shape-changing, berserker, and light beam powers. If Batman seemed out of place in this setting, The Dogs of War are just ridiculous. Hex manages to finally track down Stiletta, but she's being controlled by The Combine with drugs. Hex is finally able to beat some sense into her, and after they make their escape Hex overhears an escaped slave of S'ven Tarah talking about how his mysterious captor is rumored to have come from the future. Hex decides to go take a look. . . There's not much going for this book. The art seems very rushed and is borderline bad. The story is basically setup for Hex to return to Seattle. 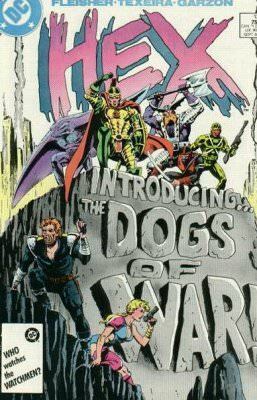 The Dogs of War shout exposition about their powers in the middle of a battle like some sort of Silver Age throwback. . .and I don't mean that in a warm and fuzzy nostalgic way. I mean that in an eye-rolling "didn't we move past this $hit by the 80's?" way. Hex and Stiletta make their way back west to Seattle and stumble onto the aftermath of a Dogs of War attack. 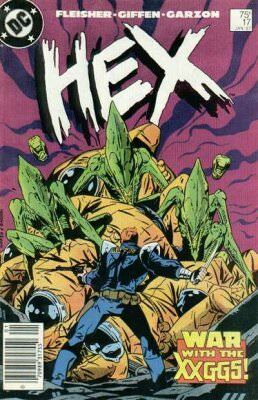 As they investigate, Hex is attacked by the Conglomerate assassin he thought he had killed in issue #5, only this time he's wearing a super-powered suit of armor. While Hex and the assassin battle, Stiletta goes crazy because of the Combine implants they put inside her brain to make her a stronger and faster fighter. After a brutal fight, Hex barely defeats the Conglomerate assassin, but can't catch a break as he is attacked by The Dogs of War. Holy art change! 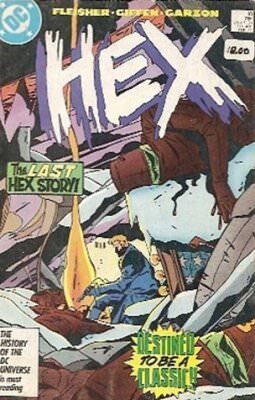 With this issue until the end of the road, Keith Giffen brings his unique style to HEX. While I'm generally a fan of Giffen's work, the garish colors and weak inking that kicked Texeira's art down a notch do the same thing to Giffen's. It's a damn shame, because done right Giffen MIGHT have bought this series a bit more time. The cover on this one is one of the top 3 of the series. . .so there's that, at least. As for the story itself. . .pretty weak. Hex and Stiletta's 3,000 mile trip across country is given about 3 panels. 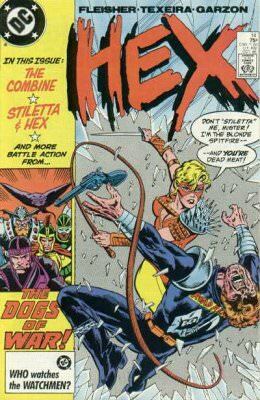 Hex battles a villainous Iron Man copy. . .and that's about it. This issue is pretty much one long fight scene. Hex is captured and enslaved by S'ven Tarah. It is revealed that the mysterious being is from the far future, where the human race is enslaved by aliens called Xxgg's. He is enslaving 21st century humans in a desperate bid to build a device to save his own time from invasion. Hex engineers a mass slave escape so that he can try to find S'ven Tarah and the means he uses to travel through time. In the meantime, Stiletta infiltrates S'ven Tarah's compound in order to try and rescue Hex. 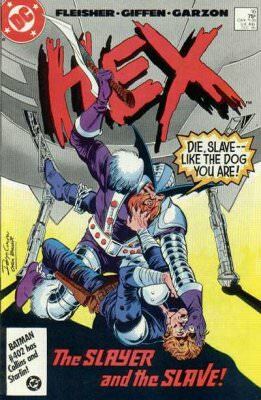 As Hex explores the compound after his escape, he is attacked by The Dogs of War, but is recognized by Stanley Harris. The story here is pretty much a lot of robot punching and setup for the finale and not much else. The art makes it a bit of a hot mess because of Giffen's use of 9 and 12 panel pages. The tiny panels make it hard to tell what's going on when there's so much action. After Hex and Stiletta are brought before S'ven Tarah, an Xxgg liquidation team arrives from the future to put a stop to his plan to save the future. The Dogs of War are beaten badly and forced to retreat, but Hex comes up with a plan that destroys the aliens, but S'ven Tarah tells him that they will never stop, so he must return to the future. Jonah asks to be sent back to the past, but is refused because the time machine only has enough energy for one trip, and if S'ven Tarah doesn't return, then the aliens will simply invade the 21st century instead of in his time. The Dogs of War leave earth in a starship, S'ven Tarah returns to the future, and Jonah Hex remains trapped in 2050. This issue wraps up the whole Dogs of War/ Xxgg War storyline, but does it in a pretty sloppy way. It's basically one long fight scene as the aliens invade and S'ven Tarah desperately tries to delay them in order to launch the starship he's been building. Giffen's art and tiny panel method aren't well suited for the amount of action involved. Plus it's been plain from issue #13 that Fleisher isn't comfortable with superhero dialogue and it REALLY shows in this issue. There's a great character moment as Jonah Hex swallows his pride and practically begs to be sent back to 1875, and his disappointment in finding out that he can't. . .and then does the right thing by not trying to force it. Probably the best moment for Hex in the whole series as he truly becomes the hero he insists he isn't. Unfortunately, except for those two pages, this isn't a great issue at all. It ties everything up pretty neatly, but the art's a mess and the story it wraps up was generally weak and a poor fit for this series in the first place. A badly-wounded Jonah Hex fights off bandits and hallucinates about his early life with his brutally abusive father. After he is rescued by Stiletta and recovering from his wounds, he discovers his own stuffed corpse in a museum warehouse and realizes it means that he will return to his own time eventually. Although the Hex storyline ended with issue #17, this standalone epilogue is a decent ending to the run as a whole. The story is pretty well worn. . .the hero thinks back on his life as he bleeds out. . .but it's not too bad, especially compared with the superhero/alien invasion storyline that came before it. Giffen's art has more of a chance to stretch out when not forced to portray constant, chaotic battle scenes, and the coloring isn't as garish as it had been. The final scene of Jonah Hex coming face to face with his own corpse, stuffed and mounted as a sideshow display, was very nicely done as well. Overall, most of this series has been a bit of a mess. . .especially since issue #8. . .but the final issue is a nice sendoff for this unusual fish out of water tale. 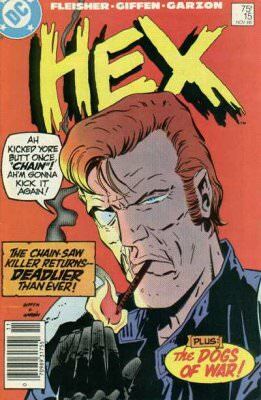 Although there were good moments scattered here and there, HEX was a comic series with some serious problems. After the initial story arc, the series never really found its footing and was unable to continue forward in a successful way. I'm not sure what sort of background drama was going on, but as of issue #10 there is a definite push to include superheroes into HEX. . .unfortunately, it's plain to see that Michael Fleisher wasn't comfortable with writing superhero dialogue or storylines and it pretty much sunk the whole boat in terms of storytelling. The art on this series was never spectacular in any way. . .which is strange considering that artists like Mark Texeira and Keith Giffen were featured. Unfortunately, the coloring from the first issue was garish. The inkers never really complimented the artists either, so the art never reached the level that one would expect based on the names involved. It's too bad, because great art MIGHT have carried this series a little farther. So overall what we have in this series is a strange concept that MIGHT have worked better than it did, but the whole thing was shot down by substandard art and storylines that didn't really fit either the character or the writer. As a huge Jonah Hex fan, I was interested in reading this series, but now that I have, I can't really suggest it to anyone except those like me who want to read EVERYTHING with Jonah Hex in it and are curious to see the character in an unusual setting. Nobody else is going to like this. With a bit more care, HEX could have been great. I look at the short stack of 18 issues and all I can see is wasted potential and Longbox Junk. A damn shame.